Are Insurers' Profits As Low As They Claim? A trade group says insurers only make 1 cent off every dollar spent on health care. But that figure measures insurer profits against all the money pumped into the U.S. system. Economists say profits are traditionally calculated by how much insurers spend versus how much money they take in. Are Insurers' Profits As Low As They Claim? As the health care overhaul battle moves out of Washington and onto the airways and main streets during the August recess, America's Health Insurance Plans (AHIP), the trade association for the nation's health insurers, is fighting a familiar battle. 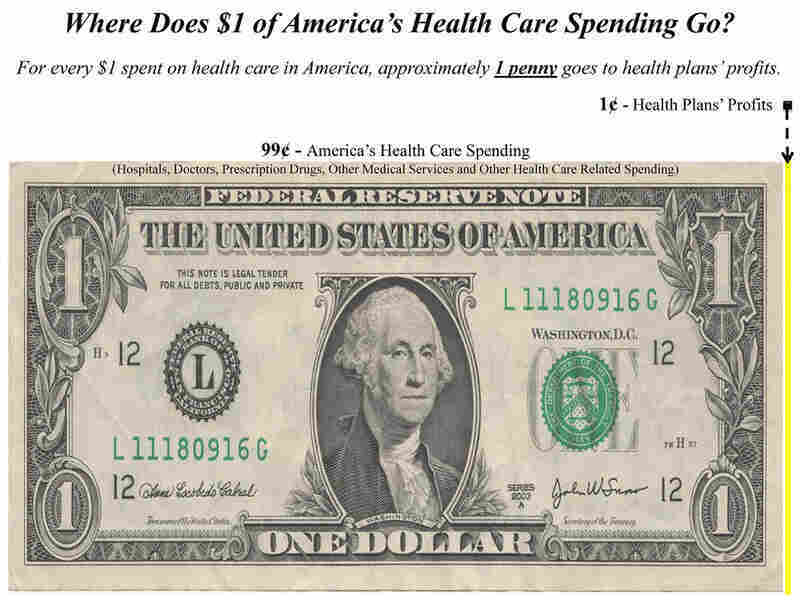 This illustration from America's Health Insurance Plans' blog is meant to show that 1 cent of every dollar spent on health care goes to health plans' profits. The McKinsey Global Institute calculated health plans' after-tax profits to be $21 billion in 2006, while national health spending for that year was $2.112 trillion. It is fighting the perception that health insurance companies focus more on their shareholders' bottom lines than the interest of their patients. To negate this notion, AHIP features a dollar bill with one tiny slice out of it (shown below) on their Web site, illustrating that their members only make 1 cent of every dollar spent on health care. That may be the case, says Princeton economist Uwe Reinhardt, but "whether it's fair or not depends on what it is you want to describe," he says. "All that statement says is, if you eliminated all our [insurance company] profits, national health spending in America would be 1 percent lower. It has meaning only in that context," Reinhardt says. Insurers are measuring their profits against total health care spending. That's all the money you and I and employers and insurers and the government spend for doctors' visits, hospitalizations, drugs and other things. But many economists calculate insurance company profits differently. Just like for any other business, they look at what the companies take in — in this case in premiums — versus what they pay out directly, as in claims. For the 10 biggest insurers in the year 2006 (the year the insurers used for the 1 cent out of every dollar depiction above), profits were anywhere from 2 to 10 percent, or two to 10 pennies on the dollar. That's two to 10 times as much as what the insurance industry group suggests in its illustrations. Robert Zirkelbach, a spokesperson for the insurers, defends the depiction. "Health plans are providing value-added services to people across the country, and the vast majority of people are expressing very high satisfaction with their health care coverage," he says. And, Zirkelbach adds, health plan profits are in line or even lower than other health care industries. But that may not be enough to give them cover as the Obama administration searches for places to cut the nation's health care bill.